We all know Santa is a busy man this time of year, but somehow he still finds time to visit several places around Chattanooga. Make a date for your little list makers to personally hand off their letters at these area events. Nov. 10-Dec. 24, 2018, Mon.-Sat. :10 a.m.-9 p.m., Sun. 12-6 p.m.
Pet Nights: Nov. 12, 19 & 26 and Dec. 3 & 10, 6-9 p.m. *All pets must be on a leash or in a carrier. Santa Mocs: Nov. 15, 6-9 p.m. &apos;Tis the season to take pictures with UTC athletes & Santa in his Mocs-themed suit. Nov. 23, 2018, 5:00-9:00 p.m.
Nov. 30, Dec. 1, 7-8, 14-15, 21-22, 2018, 5:30 p.m. & 7:30 p.m.
Dec. 1-2, 6-9, 13-23, 2018, 12-8 p.m.
Dec. 7-8, 10-11, & 12, 2018, 5-7 p.m. 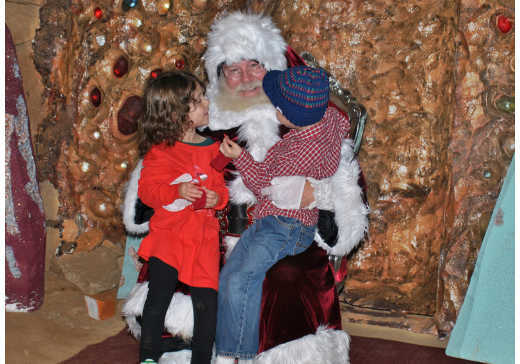 Check out Holidays in Chattanooga for more holiday fun.